Tonight feels cold and in need of something warm and creamy. 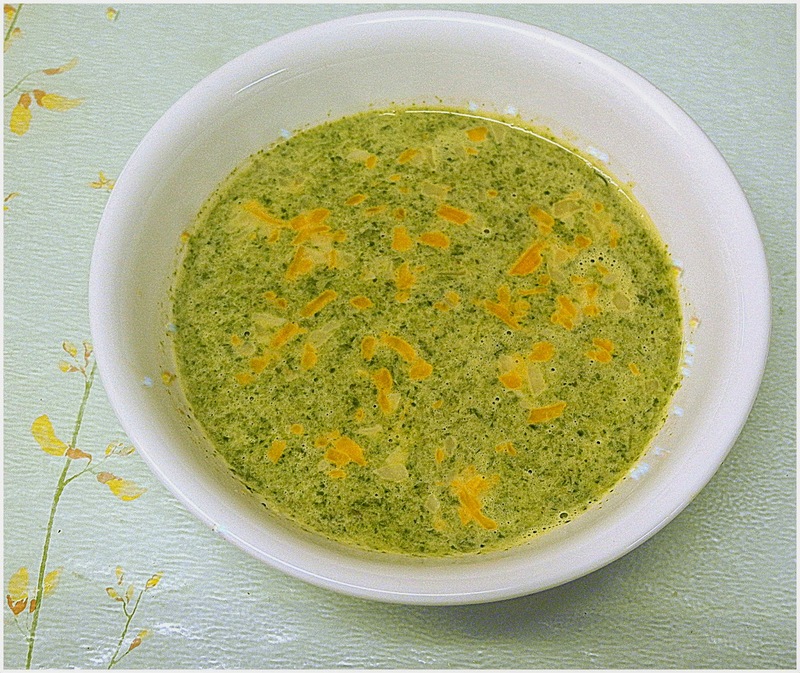 I went to my old blog, My Sweet and Savory and found this delicious soup. The words below are from my original printing. I did make some changes tonight which are reflected in the recipe. I could have had a dozen bowls of this soup. It was not filling. It has a wonderful taste to it, combination of spinach and parsley with that spurt of sour cream and Mexican cheese. Why don't I make this more often? had a problem finding new ones that most of us loved. Mark has made changes in his cooking style and now can be looked at as a healthy chef. ingredients, I had not thought to put together, until Mark listed it as an option. Place 1 sliced onion, 2 cups water, 2 cups broth and pepper in a pot over high heat. Boil, cover, lower the heat and simmer until the onion is tender, about 10 minutes. Add 10 ounces chopped spinach and 1/2 cup parsley leaves; cook until the spinach is tender, 2 to 3 minutes. Add 1 cup sour cream and Mexican cheese and purée, using immersion blender. Eat and enjoy. This is scrumptious and I have a feeling, I could eat it daily. It is quick and easy to make and warms you up. Sour cream and cheese...the spinach soup must be very flavourful! This sounds so yummy for a cold evening! I love soup of almost any kind, and have been trying to find something new to make, I think this will be it! Delicious soup with sour cream and cheese, thanks for sharing with Hearth and soul blog hop. pinning. Bittman is great. Thanks so much for bringing this by Weekend Bites.